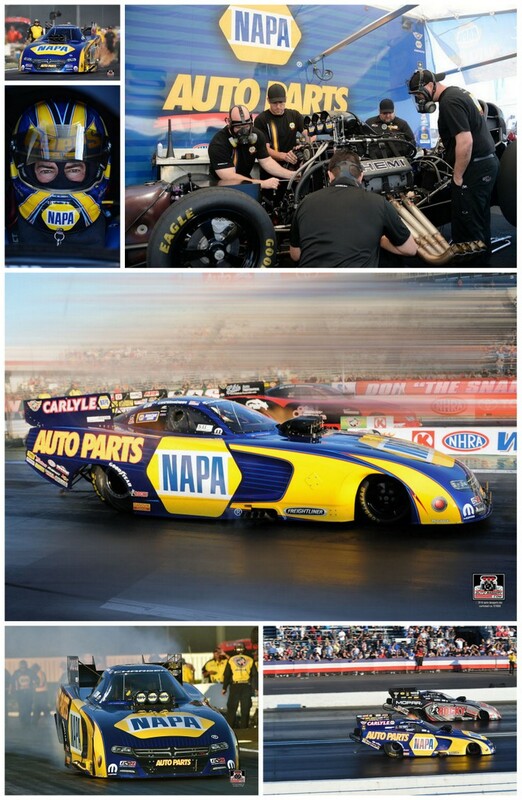 POMONA, Calif. (Feb. 8, 2015) – Every time Ron Capps races in Pomona, Calif., the NHRA Mello Yello Drag Racing Series event becomes a reunion for his family and friends. 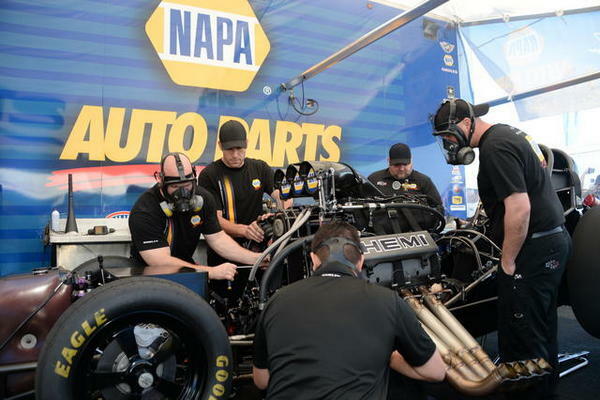 The first race of the 2015 NHRA schedule was no different. 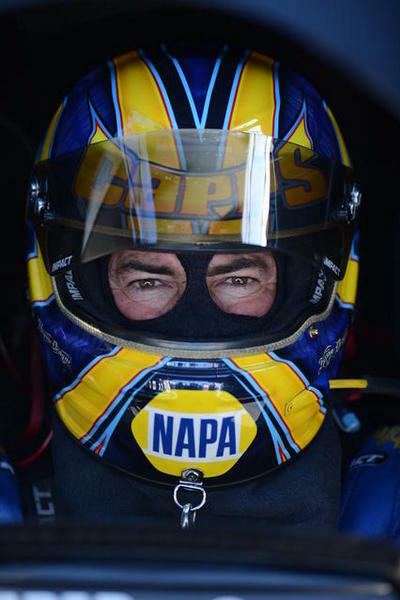 The driver of Don Schumacher Racing’s NAPA AUTO PARTS 2015 Dodge Charger R/T grew up in San Luis Obispo on California’s central coast and for the past several years lives in Carlsbad near San Diego. 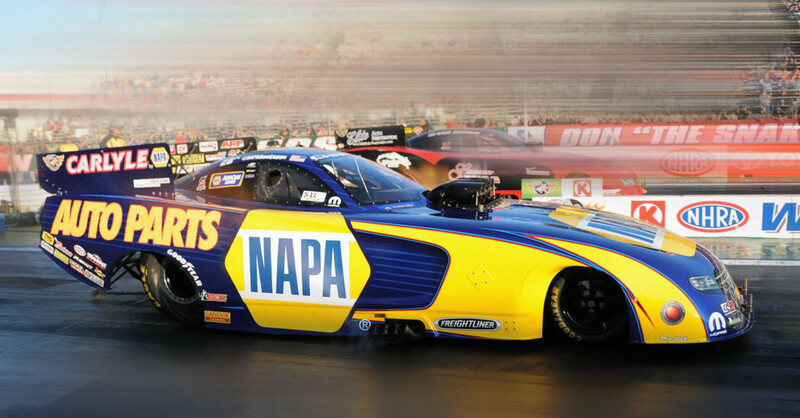 Sunday’s get-together nearly had a storybook end when Ron advanced to the 86th championship round of his vaunted career before losing a close race for the NHRA Wally trophy to DSR teammate Matt Hagan. Ron took a big lead off the starting line against Hagan with a much quicker reaction time (0.046 to 0.074 seconds) but Hagan pulled out the win with the day’s quickest time of 4.011 seconds at the day’s top speed of 320.89 mph to Ron’s 4.078 (314.90), which was the best of the day for the NAPA AUTO PARTS team led by crew chief Rahn Tobler. “I knew their car was going to run good and our car was running pretty good all weekend,” Ron said. “That’s what it’s all about. Ron won his first-round race with a better reaction time to overcome Alexis DeJoria’s quicker car. 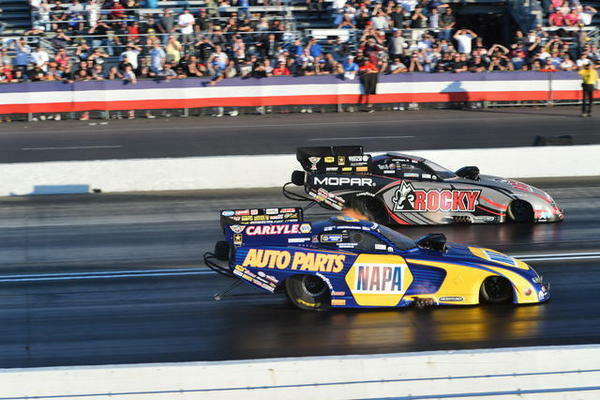 In the quarterfinals, the NAPA Dodge ran a 4.104 (313.88) and his opponent, Bob Bode, who upset John Force in the opening round, had an electrical problem and was unable to start his car. In the semifinals, Ron’s time of 4.134 (312.57) easily beat Robert Hight. 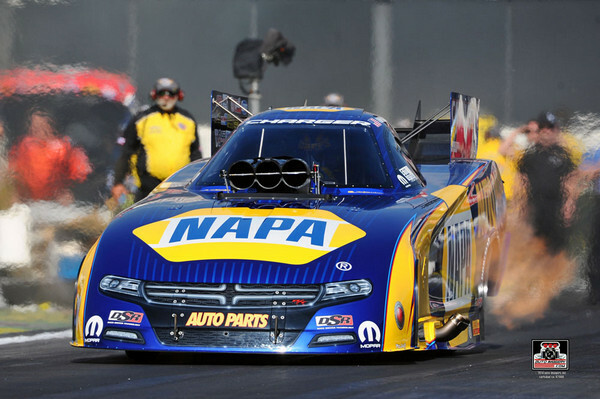 It was an impressive debut for DSR’s new Dodge Charger R/T Funny Car body with two teams advancing to the championship round and DSR teammate Tommy Johnson Jr. qualifying No. 2. Ron’s only regret was that team owner Don Schumacher couldn’t attend. Schumacher is in the midst of radiation treatment following surgery in November. “I wish Don was here to celebrate with us. Having both cars in the final was great but I am bummed we couldn’t get the Wally trophy back to down to him. “It’s a great start and that’s what we wanted to get out of Pomona. There have been so many exciting things happening for us like the new NAPA TV commercial that’s coming out this month. It will be a lot of fun for the fans. Unofficial 2015 standings after 1 of 24 events.